The G12-35XC was introduced in 2014 to commemorate Celestion’s 90th birthday; as a special edition production-run, limited to just 3000. 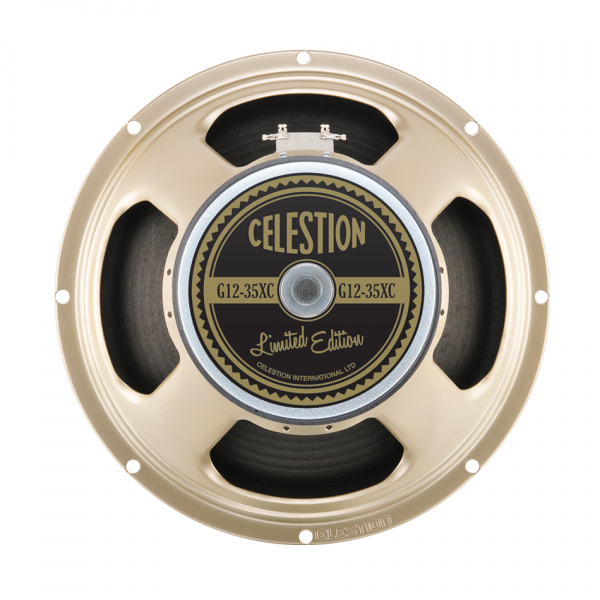 Featuring a 42 oz magnet – the only Celestion guitar speaker to do so – the 35XC was built combining tried-and-tested materials and construction methods together with new design techniques. The intention was to create a speaker that had truly vintage sonic characteristics; with the poise, fluidity and musicality reminiscent of the legendary Pulsonic-coned speakers from the 1960s. The speaker is fully capable of delivering an open, chiming clean sound without the need to sacrifice a satisfying overdriven growl or blistering high-gain lead lines. Increasingly difficult to come by, the G12-35XC has now been immortalised as a collection of digitally downloadable impulse responses, so now it’s available to buy with no limits!